, Nov. 26, 2018 /PRNewswire/ -- Singapore-based startup CSE SG Pte Ltd unveils the Smart Contract 2.0 solutions which runs on their CSE 3.0 platform. At the recent Singapore Fintech Festival 2018, Mr Chen Guo-ping , CTO of CSE Singapore explains that while blockchain was initially focused on the financial sector, but other sectors such as: agriculture, logistics, education, supply-chain management, healthcare, and banking are now starting to apply blockchain technology to enhance their business processes. 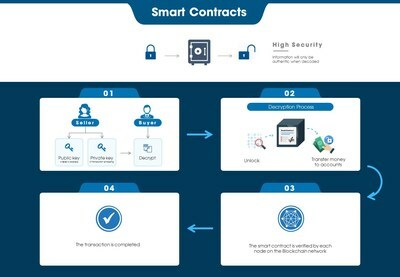 , reveals that over the last 2.5 years CSE has invested in Smart contract 2.0, a tool that allows an average user without coding experience, technology experience or legal background to create their own contract. Mr Adrian Burgi , an attorney from Switzerland specializing in the banking industry, highlights that the blockchain technology is disrupting the financial industry. Adrian explains that some blockchain players are differentiating themselves in terms of security and speed, and he thinks that CSE is a good competitor in these aspects.
. Its has developed a proprietary CSE 3.0 technology that creates an improved Blockchain platform with breakthrough features from the application of encryption technology, blockchain foundation, blockchain pool 3.0, smart contract 2.0, artificial intelligence, internet of things, supernode cloud, etc. CSE 3.0 can be applied to the creation of retail payment at very low cost, super fast speed and even with no internet connectivity; applications in traceability of products; encrypting and management of information in medical, financial and other industries.